An eMTB with a Yamaha SyncDrive Pro central drive system with a peak power of 800 W and maximum torque of up to 80 Nm. The ALUXX aluminium frame combined with the SyncDrive Pro powered by Yamaha motor ensures good handling and smooth acceleration in any riding conditions. The smoothness of assistance to your pedaling force is handled by the 4-sensor technology Giant PedalPlus. 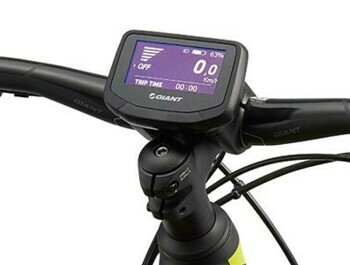 The 5 levels of assistance are controled by buttons with LED indicator on the handlebars. The suspension fork from Rock Shox with 120 mm travel.